I was born in Arusha, Tanzania in Africa below the slopes of Mount Meru and her majestic neighbour Kilimanjaro. During the 70's my parents left Tanzania for greener pastures in South Africa, first to Durban and then eventually to Johannesburg. I studied Fine Arts in Durban, South Africa, where I ventured into the world of photography, loving the hours in the darkroom developing predominately black and white photos. I started my career in advertising, progressing to interior design and eventually to photography full time. In recent years I have gone back to live in Asiago, northern Italy near the Dolomites where my ancestors originated. I have a huge love for Europe and the diverse beauty she offers, and this continues to inspire me to use the magic of light and capture what my eye sees and share it with the rest of the world. Chris Dale is a photographer based in Nottingham and passionate about shooting locally, even when there are no big landmarks or epic vistas, revisiting the same area over a long period and exploring different ways to represent the landscape. The images concentrate mostly on intimate woodland scenes and abstract interpretations, trying to capture the essence of the place at that time. I am a software engineer and photographer based out of Southern Alberta since 1997. First inspired by the beautiful rocky mountains that I call my home, my pictures have focused on capturing the beauty and uniqueness the world of landscape photography has to offer. returned to photography more seriously about five years ago. I’m drawn to landscape photography, partly because of a background in horticulture and landscape design, but also because of a lifelong interest and pleasure in the outdoors and natural world. 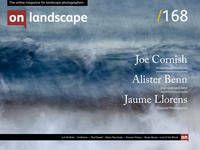 Welcome to our 4x4 feature which is a set of four mini landscape photography portfolios submitted from our subscribers. Each portfolios consisting of four images related in some way. Interested in submitting your work? We're on the lookout for new portfolios for the next few issues, so please do get in touch! If you would like to submit your 4x4 portfolio, please visit this page for submission information. You can view previous 4x4 portfolios here.